There is a general misconception that any dentist is qualified to surgically place implants. The truth is that it is legal for any licensed dentist to place implants, however, not every dentist has had extensive training and experience in implant placement procedures, or experience handling potential complications that can occur. In the right hands, implant treatment is extremely successful. Surgical specialists (periodontists and oral surgeons) have had extensive training and experience with surgical procedures and complications. Most surgical specialists have had extensive training in implant procedures and many also have a great deal of experience with implant surgery. Unfortunately, many dentists surgically place implants after taking an abbreviated course on implant surgery. These courses do not prepare the participants to predict, diagnose, and treat potential complications. Studies have proven that implant success rates depend on the experience of the surgeon. In a study published by Lambert et al., experienced surgeons achieved a 96% implant survival rate, while inexperienced practitioners only had a 73% implant survival rate. (Lambert P, Morris HF, Ochi S. Relationship between implant surgical experience and second-stage failures: DICRG interim report no. 2. Implant Dent 1994;3:97-99). 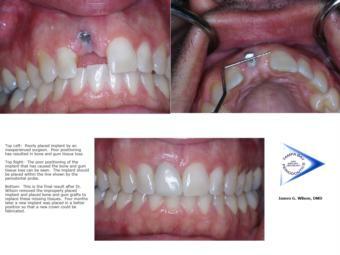 The case shown on this page proves that implant success, however, can not be based only on implant survival. The implant placed by the inexperienced surgeon was successful in that it had integrated to the jawbone and was ready for restoration The placement position, however, was incorrect and a cosmetic result was not achievable with where the implant had been placed. This successful implant had to be removed by Dr. Wilson to achieve a cosmetic result. It's important to understand that complications can occur even when experienced surgeons are treating patients. However, due to their extensive training and experience managing complications, experienced surgeons such as Dr. Wilson are better prepared to handle these situations. Because there are no guidelines regarding the training needed prior to surgically placing dental implants, it is critical for patients to ask questions about training and experience prior to undergoing implant surgery. Keep in mind that dental implants have a very high success rate in the hands of experienced doctors. The following questions can assist you in selecting your implant surgeon. 1. Is your implant surgeon a board certified specialist? Traditionally, based on training and experience, a dental specialist such as a periodontist or oral and maxillofacial surgeon would precisely place the dental implant in a precise location and the general dentist (your dentist) would restore or place the crown on the integrated implant. However, in some cases, things have changed. Some general dentists, along with all of the other procedures they ordinarily and routinely perform on a day to day basis, are placing and restoring dental implants by themselves, in their general practices. Any dentist with a diploma can legally place an implant and many do so after relatively brief surgical training. This could be a problem for the patient should unforeseen complications arise during or after surgery. On the other hand, a dental specialist with surgical training has taken additional years of training to learn proper surgical techniques. Dr. Wilson does not restore implants; he only places them. The dental specialty boards require high standards of training and performance and ensure them by rigid examinations. Successful applicants receive diplomas in their specialty. To become "board-certified" and then receive "Diplomate" status in their particular specialties, additional rigorous testing must be passed before the specialty board. Periodontists have 2 to 3 years of residency training after four years of dental school. The recognized standard-setting organization for periodontists is the American Board of Periodontology. Dr. Wilson is a Diplomate of the American Board of Periodontology. 2. How long has your implant surgeon been placing dental implants? Dr. Wilson has been placing implants since 1993. It was a significant focus during his oral maxillofacial surgery fellowship as well as his three-year periodontal residency. As part of his Advanced Education in General Dentistry residency, Dr. Wilson restored dental implants, providing a unique perspective of understanding the restoring doctor's needs while surgically placing the dental implant(s). Despite years of experience with dental implant placement he is still learning and often faces challenging situations that require the kind of extraordinary experience and skill that only comes with years of experience. Make sure you are not at the beginning of someone’s learning curve. 3. How many implants does he or she place a year and with what success rate? Improved technology have made implants easier to place successfully but implant surgeons must still assess and treat each case individually to ensure a predictable and successful outcome. An implant surgeon's success rate is representative of that practitioner's overall knowledge, skills, and clinical judgment. A experienced surgeon knows when the situation is just right to place the implant, knows how to place the implant with functional, restorative and esthetic considerations addressed and knows what adjunctive procedures may need to be done before, during, and after implant placement. Successful implant integration varies depending on the area of the mouth in which it is placed. Multiple studies suggest that implant success rates in the hands of experienced surgeons should be in the 94-98% range. Dr. Wilson regularly places between 300-350 implants per year. He has achieved a success rate of greater than 99%. This success rate takes into account all implants placed ranging from the most routine to the most complex cases. For those rare implants that "fail" to integrate, in most cases they can be successfully replaced with another implant. You want the dentist that places your implants to be experienced and knowledgeable in handling the most routine dental implant procedures, as well as the most complex dental implant procedures. There is a difference between someone that places 15 implants a year and someone that places hundreds every year. 4. What is their training in dental implants? As frightening as it may seem, many dentists today take one or two-day courses on dental implant placement, work on plastic model jaws and/or buy surgical implant kits to get started in dental implant placement. You should ALWAYS check to make sure your dentist has the proper training, experience and credentials. Does your implant dentist’s training consist of a series of week-end courses or years of an accredited residency program? Experience matters! 5. If you're treatment requires additional procedures to enhance the final esthetic and functional results, such as bone or soft tissue grafting, how many of these procedures has your doctor done? As part of their training, periodontists and oral surgeons spend countless hours in the classroom and performing treatment on patients under the watchful eyes of experience mentors. Many procedures that were developed for natural teeth have been modified to enhance the results of dental implant treatment. In order to achieve an exceptional result in implant dentistry a doctor must have an intimate knowledge of bone and soft tissue biology and the procedures that can manipulate them. Dr. Wilson routinely performs bone grafting and soft tissue grafting procedures on both teeth and dental implants as well as in preparation for the future placement of dental implants. 6. Does your implant surgeon perform a comprehensive initial examination prior to diagnosis and treatment? 7. How many dental implants does your implant surgeon keep on hand? Nothing is more frustrating to a patient (and their doctor) than to be in the middle of surgery when the doctor has to abort the procedure because he/she doesn't have the proper materials. Even more dangerous is when the surgeon attempts to place the implant they do have on hand and it is the wrong size. Implants come in many different sizes and shapes. There are many situations that call for different implant sizes than were originally planned. A dentist that places hundreds of dental implants a year will always have 30 to 40 additional implants on hand to address unforeseen changes in your treatment situation. A dentist that only orders implants for individual cases may not be able to handle every situation that arises. 8. Does the dental surgeon have the latest technology to diagnose and treat? Digital X-Rays: Make the surgery faster, safer and more predictable. (it takes seconds to see an image). In-office cat-scan imaging systemB, such as the I-cat cone beam scanner, that can better capture and more accurately analyze images of the jaw, nerves, tooth roots, sinuses and other data in a non-invasive and painless procedure. Utilizing state of the art software such as SimPlant we are able view 3-dimensional computer images of the jawbone to properly plan and perform successful dental implant treatment. We can visualize your implant surgery on the computer before we perform the actual treatment, thus increasing the likelihood of a successful outcome for our patients. We view this as essential technology for dental implant placement, along with other uses. 9. What brand of implants does your dentist use? Dr. Wilson utilizes Straumann dental implants, the world's largest maker of dental implants. The first Straumann dental implant was placed and underwent clinical testing at the University of Berne (Switzerland) in 1974. These implants are developed in collaboration with the International Team for Implantology (ITI), a nonprofit academic organization of clinicians and researchers active in research, development, and dental implant education. Without research and the approval of the ITI, the Straumann Corporation is not permitted to bring a dental implant to the commercial market. The fact is that some dental implant companies have been researching the science of dental implants for over 35 years, and some are copycat companies that are manufacturing cheap, low-quality knock-off implants, that are marketed to dentists as “low-cost” dental implants. They have poor quality controls and significantly higher rates of implant failure are not uncommon. Bargain implants present another potential problem. If a smaller company goes out of business, there is a high likelihood that if you ever need replacement components in the future, they will not be available. For instance, if you were in a car accident and broke off an implant crown. Ask yourself: Do you want an implant from a company that promotes being the low cost leader in dental implants or one that is from a worldwide leading company with 35 years of research and science? Better yet, ask your dentist! Implant placement is a high tech, constantly evolving area of dentistry. Dr. Wilson continuously studies the latest research for implant systems that can improve on and best meet the patient’s needs.